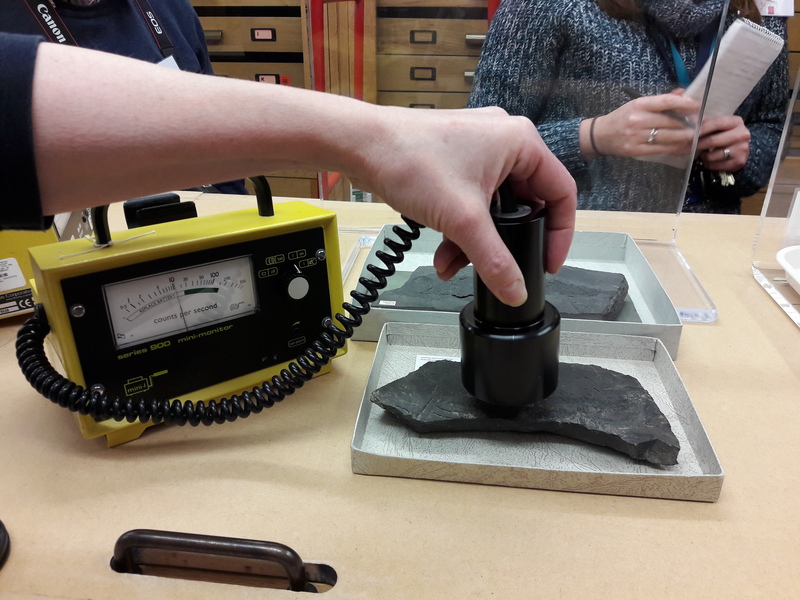 In what must surely be one of the most excitingly themed workshops known to scientists, Monica Price (formerly of Oxford University Museum of Natural History) and Jana Horak (Amgueddfa Cymru – National Museum Wales) recently ran a day-long workshop called Hazards in Geological Collections. We’re not talking hazards like booklice eating your specimen labels, we’re talking The Big Guns. It was Christmas come early for the attendees who had gathered from the ‘four corners’ of the British Isles to learn what villainstreasures might be lurking in their collections. Hazards in geological collections take many forms. © Oxford University Museum of Natural History. Each of the three tables of eager minds was presented with a box of unlabelled specimens from which to try and list the potential hazards. After a very thorough health and safety briefing, we all leaned cautiously in towards the box. Decked out in nitrile gloves and face masks, we were the picture of professionalism. The excitement of the workshop was definitely heightened by the real, LIVE specimens in front of us. Had any of us had been stupid enough to open up and breathe in the contents of an asbestos tube, or rub ourselves all over with a toxic mineral, we could have done ourselves some serious harm. But as it was, the 20 or so geologists in the room were suitably well-behaved. Suited and booted; ready to dive in. © Oxford University Museum of Natural History. Ascertaining the risk level of working with a collection is about determining the potential exposure to a hazard as well as the possible impacts. For example if you have 50 specimens of highly radioactive rocks sitting unboxed on your desk, that you pick up with bare hands and close to your face to examine all day every day for 35 years… you are, unsurprisingly, at (very) high risk from radiation. If your specimens are packaged correctly according to the risk they pose, and stored in a suitable location away from direct, or frequent contact with humans, or other valuable organic life-forms*, this significantly reduces the risk. Hazardous materials don’t just sit in the radioactive and asbestos categories, the potential issues are numerous; many rocks contain toxins (some natural, others brought in/used by humans), biohazards, particulates, and a no brainer for many a ‘box of rocks’- its weight. A quick survey of the room led to the conclusion that all (present) curators and collections staff have suffered a variety of back troubles due to their collections. Riebeckite var crocidolite; i.e. a type of asbestos. © Oxford University Museum of Natural History. 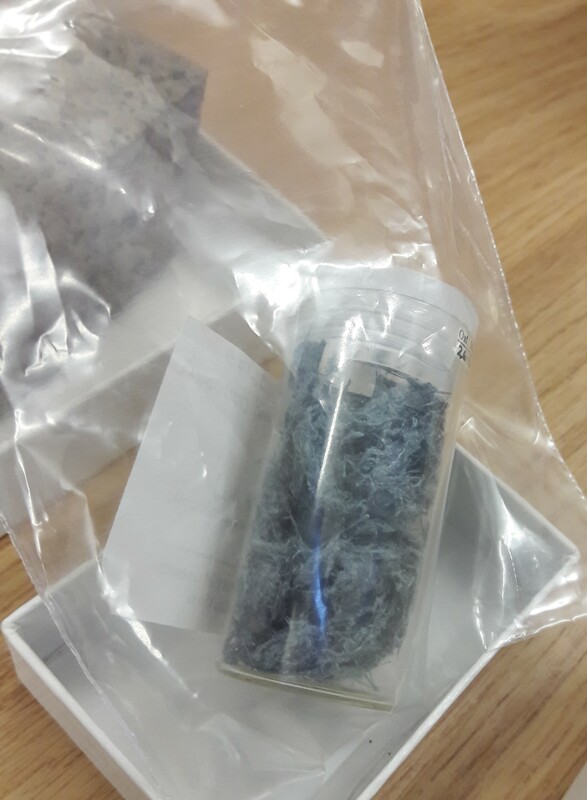 Although not relevant to geology or palaeontology, I was particularly interested to find out it may be possible to contract anthrax, and even the plague, from diseased tissue in museum collections. Blimey. Having assessed the types of risks your collections may pose to you and your colleagues, as well as volunteers, students, researchers, and everyone else you can think of, and not forgetting the emergency services should they need to enter the building, it is vital to understand the situation correctly and subsequently manage it appropriately. When I say appropriately, if for example you have reason to believe there may be asbestos or asbestiform minerals in your collection, it is a legal requirement to get ‘Non-Licensed Asbestos Work’ training before you are able to carry out a survey of the material. The second practical element to the day comprised some good old radioactive fish. I was fascinated by the Geiger counter’s ability to remain (relatively) silent over the rock but burst into life and buzz like a bee on a honey high when directed over the fossil, having moved only a couple of centimetres. After lots of super-clever nerd jokes about the fish cooking itself and lacking only in its absence of chips, we moved on to sensible advice about storing radioactive material. For example you should spread your material out, as the more radioactive material you have in one place, the higher the dosage you’ll receive when working in that area. You must label everything with specific hazard signs, i.e. ‘Radioactive’, ‘Asbestos’, etc. A radioactive fish (Coccosteus sp.) from the Old Red Sandstone in Orkney, Scotland. © Oxford University Museum of Natural History. Frustratingly (or excitingly if you like solving mysteries) when attempting to find out what hazardous minerals might be in your collections, you need to keep in mind arcane terms, for example, the asbestos mineral most of us know as Actinolite, could also be labelled as Attinoto, byssolite, stibolite, stralite, strahlenstein, zillertite/zillerthite, manganactinolite, or ferro-tremolite. Great, that makes it easy. I think the biggest take-home message of the day was- if you aren’t sure, ask for help from someone who knows what they’re doing. Hazardous collections shouldn’t be taken lightly, and getting it wrong isn’t worth the risk to your health or other people’s. The day was extremely informative, not to mention highly exciting. I should like to do the whole thing again, just for enjoyments sake. I thoroughly recommend going on a course like this if you are the custodian of a geological or palaeontological collection. In the meantime, here are two rather handy references for you, written coincidentally by Monica and Jana (amongst others) who ran the course. Enjoy! Horak, J., Faithfull, J., Price, M., & Davidson, P. 2016. 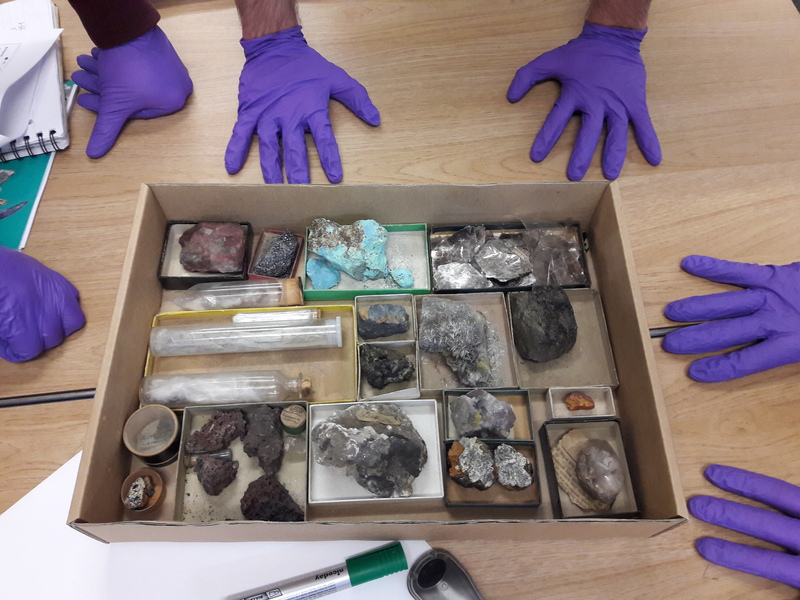 Identifying and managing asbestiform minerals in geological collections. Journal of Natural Science Collections. 3. pp.51-61. Price, M., Horak, J., & Faithfull, J. 2013. 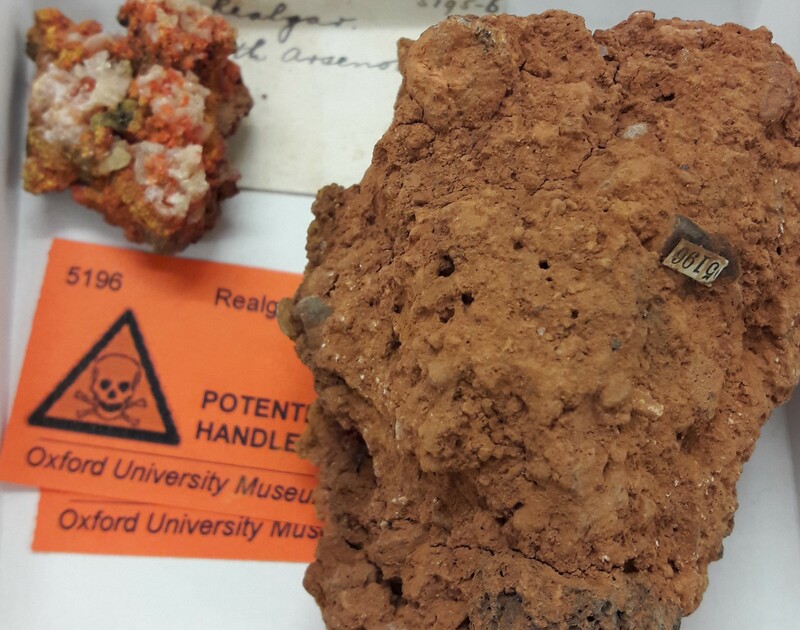 Identifying and managing radioactive geological specimens. Journal of Natural Science Collections. 1. pp.27-33. * Although not so commonly kept these days, museum cats (mousers) were identified during a brainstorm as being at risk from hazardous material. Written by Dr Emma Louise Nicholls, Deputy Keeper of Natural History at the Horniman Museum and Gardens.